ProtonMail recently released their Linux beta for Bridge, which provides IMAP/SMTP access to the service. Prior to Bridge you could only access the service through the web interface, which is sort of clunky and requires you to, among other things, rely on their search, which is limited by the fact that they can't really index your emails - because you're paying them not to read the message bodies! ProtonMail provides instructions for setting up the Bridge with common email applications like Thunderbird, but that's about it. So here's how to set it up with NeoMutt and OfflineIMAP for fetching our emails. These instructions are for Ubuntu 16.04, but I imagine they aren't much different for other distributions (yours might even have a package you can install). The Bridge can be run from the command line with the Desktop-Bridge program. By default this opens a GUI to setup your accounts, but you can also access a console interface with Desktop-Bridge --cli. If you aren't already logged in you need to run the login command in this interface. First thing to do is configure OfflineIMAP to access our ProtonMail emails. Basically this sets up an account arbitrarily called main which will store emails at ~/.mail in the Maildir format. It will only sync the INBOX, Archive, and Sent folders to/from ProtonMail (the folderfilter option). Emails deleted locally will also be deleted on ProtonMail (the sync_deletes option) and emails deleted on ProtonMail will be deleted locally (the expunge option). After OfflineIMAP fetches new email, it will run the command defined for postsynchook, which in this case is is the notmuch command for updating its search index (notmuch new). Bridge generates a Bridge-specific password for you to use, so use that here and not your actual ProtonMail password. Disable SSL because it was (at least when I set this up) not working with Bridge. But this seems like a non-issue because it's over a local connection anyways and the actual outgoing connection to ProtonMail is encrypted. Then try running it using the offlineimap command. There is a lot to configure in NeoMutt, so I'll only cover what is necessary to get this setup working. If you're interested in seeing more, my NeoMutt config at time of writing is available here. This just opens up a new tmux session and runs the Bridge inside of it. I encountered an interesting challenge the other day while working on a transit demand model for the PolicySpace project (under Bernardo Furtado at the IPEA/Institute of Applied Economic Research). We have bus data for Belo Horizonte, one of the largest cities in Brazil (and South America). Specifically, we have GTFS (General Transit Feed Specification) data with geographic coordinates of bus stops. We also have a network of the city's roads, with data provided by OpenStreetMaps and accessed with the osmnx library. The library provides us with the geographic and UTM (Universal Transverse Mercator) projected coordinates for nodes as well as line geometries for most of the edges (edges which are just straight lines don't have geometries provided, but they can be inferred from the coordinates of their start and end nodes). How do we meaningfully map these bus stops to our road network? The first instinct might be to associate them with their closest node, but many bus stops start somewhere along a road rather than at the start or end of one. So we need to be able to find the closest point along a road for a given bus stop. This is trickier because whereas nodes can be treated as single points, roads potentially have winding geometries. A road which starts and ends far from a bus stop might nevertheless have a very close point to the bus stop somewhere along it. We want to accommodate these kinds of cases. The first step is to find candidate edges that are close enough to the bus stop to be plausible roads for it. We have bounding boxes for each edge's geometry, so we can accomplish this search with a quadtree, using Pyqtree. A quadtree is a data structure that indexes 2D boxes and allows you to quickly find boxes which overlap a given query box. It's sort of like a kd-tree but can search boxes in addition to points. So we index all our edges' bounding boxes into this quadtree. We pad the bounding boxes by some configurable radius, since the bus stop is likely to be in the vicinity of an edge's borders. Once we have the closest edge, we find the closest point on that edge by projecting the query point onto the edge. We don't want an absolute position, but rather how far the point is along the edge. That is, we want a value in [0,1] such that 0 is the start of the edge, 1 is the end of the edge, 0.5 is halfway along the edge, etc. shapely's normalized=True argument will take care of that for us. Now we have mappings of bus stops to positions along edges, which we can leverage when computing trip routes for our transit demand model. I've been using Linux as my main driver (Ubuntu 14.04, recently and catastrophically upgraded to 16.04, with no desktop environment; I'm using bspwm as my window manager) for about two years now. It's been challenging and frustrating, but ultimately rewarding -- the granular control is totally worth it. Over these two years I've gradually accumulated a series of Bash and Python scripts to help me work quickly and smoothly. They generally operate by two principles: accessible from anywhere and usable with as few keystrokes as possible. All the scripts are available in my dotfiles repo in the bin folder. A few of the scripts are devoted to taking screenshots (shot) or screen recordings (rec). This is a basic feature in OSX (and many Linux desktop environments, afaik), but something I had to implement manually for my system. The benefit is being able to customize the functionality quite a bit. For example, the rec script will automatically convert the screen recording into an optimized gif (using another script, vid2gif). The shot script lets me directly copy the image or the path to the screenshot immediately after it's taken, but sometimes I need to refer to an old screenshot. It's a pain to navigate to the screenshot folder and find the one I'm looking for, so I have another script, shots, which lets me browse and search through my screenshots and screengifs with dmenu (which is a menu that's basically accessible from anywhere). Entering passwords and managing sensitive information is often a really inconvenient process, but some scripts make it easier. I use KeePassX to manage my passwords, which means when I want to enter a password, I have to open up KeePassX, unlock the database, search for the password, and then copy and paste it into the password input. This is a lot of steps, but my keepass script does all this in much fewer keystrokes. I open it super+p, enter my master password, directly search for my password, and select it. Then it pastes the password into the input form automatically. It can also create and save new passwords as needed. I use 2FA on sites that support it, which means there's another step after entering a password - opening up the authenticator to get the auth code. I have another script, 2fa, which I open with super+a, that copies the appropriate auth code into my clipboard so I can paste it in straight away. These two scripts make logging in and good account security way easier to manage. For local data that I want to encrypt, I have a script called crypt that lets me easily encrypt/decrypt individual files or directories with my GPG key. I use this script in another script, vault, which makes it easy to encrypt/decrypt a particular directory (~/docs/vault) of sensitive information. Finally, I have a lock script for when I'm away from my computer that pixelates the screen contents and requires my password to unlock (this was snagged from r/unixporn). My main driver is a relatively low-powered chromebook (an Acer C720), so for heavy processing I have a beefy personal server ("hubble") that I access remotely. It's not publicly accessible - as in, it's not a box provided by a service like Digital Ocean but a literal computer under my desk. This introduces some challenges in reliably connecting to it from anywhere, so I have a few scripts to help out with that. hubble can consume quite a bit of power so I don't like to leave it running when it's not in use. It's easy enough to shut off a server remotely (shutdown now) but turning it on remotely is trickier. There's a really useful program called wakeonlan that lets you send a special packet to a network interface (specifying its MAC address) that will tell its machine to boot up. However, you still need a computer running on the same network to send that packet from. I keep a Banana Pi running at all times on that network. Its power consumption is much lower so I don't feel as bad having it run all the time. When I need to access hubble, I ssh into the Pi and then run wakeonlan to boot it up. This Pi isn't publicly accessible either - there's no public IP I can ssh directly into. Fortunately, using the script tunnel, I can create an ssh tunnel between the Pi and my hosting server (where this website and my other personal sites are kept), which does have a public IP, such that my hosting server acts as a bridge that the Pi piggybacks off of. Finally, sometimes I'll run a web service on hubble but want to access it through my laptop's browser. I can use portfwd to connect a local laptop port to one of hubble's ports, so that my laptop treats it as its own. It makes doing web development on hubble way easier. q: quickly searches my file system, with previews for images. sms: lets me send an arbitrary notification over Signal, so I can, for example, run a long-running job and get texted when it's finished: ./slow_script && sms "done!" || sms "failed!". This also accepts attachments! twitch: lets me immediately start streaming to Twitch. caffeine: prevents the computer from falling asleep. I have it bound to super+c with a eye indicator in my bar. phonesync: remotely sync photos from my phone to my laptop and media from my laptop to my phone (they must be on the same LAN though). bkup: this isn't in my dotfiles repo but I use it quite a bit -- but it lets me specify a backup system in YAML (example) that is run with bkup <backup name>. 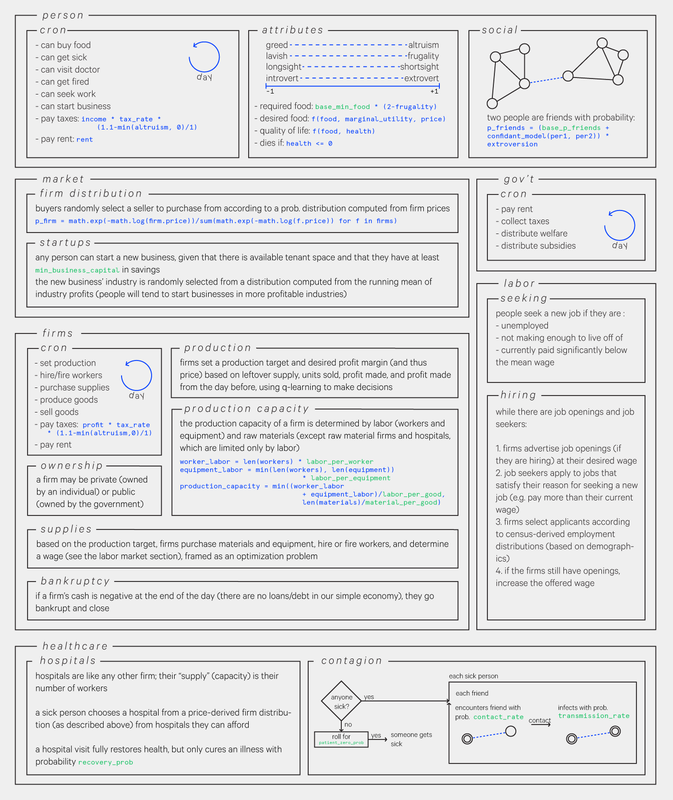 I recently wrote a conspiracy-generating bot for The New Inquiry's Conspiracy issue. The basic premise is that far-fetched conspiracy theories emerge from the human tendency for apophenia - finding meaning in random patterns - and that the problematic algorithm-level aspects of machine learning are instances of a similar phenomenon. The bot leverages how computer models can misidentify faces and objects as similar and presents these perceptual missteps as significant discoveries, encouraging humans to read additional layers of absent meaning. In this post I'll give a high-level explanation for the basic structure of the bot. If you're interested in details, the full source code is available here. 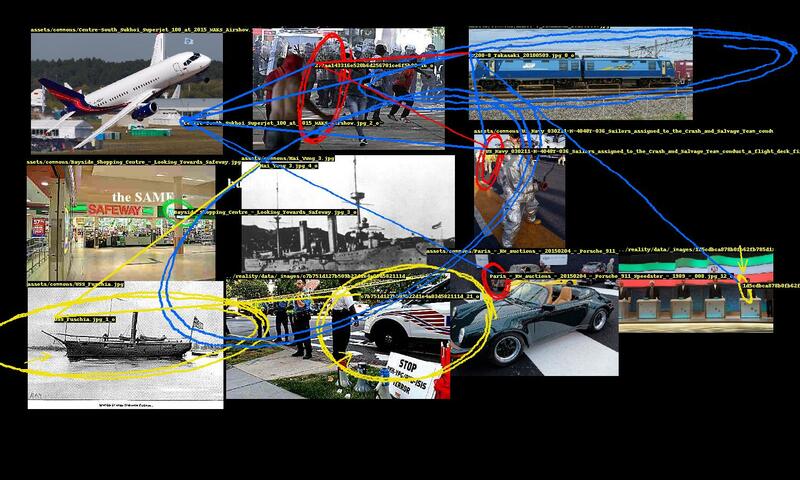 For this bot the ideal conspiracy is one that connects seemingly unrelated and distance events, people, and so on not only to each other but across time. If that connection is made to something relevant to the present, all the better. The bot's source material then should combine obscure images with a lot of breadth (encompassing paintings, personal photos, technical drawings, and the like) with immediately recognizable ones, such as those from recent news stories. Wikimedia Commons is perfect for the former. This is where all of Wikipedia's (and other Wiki sites') images are hosted, so it captures the massive variety of all those platforms. Wikimedia regularly makes full database dumps available, including one of all of the Commons' image links (commonswiki-latest-image.sql.gz). Included in the repo is a script that parses these links out of the SQL. The full set of images is massive and too large to fit on typical commodity hard drives, so the program provides a way to download a sample of those images. As each image is downloaded, the program runs object recognition (using YOLO; "people" are included as objects) and face detection (using dlib), saving the bounding boxes and crops of any detected entities so that they are easily retrieved later. For recent news images the bot uses reality, a simple system that polls several RSS feeds and saves new articles along with their main images and extracted named entities (peoples, places, organizations, and so on). When new articles are retrieved, reality updates a FIFO queue that the bot listens to. On new articles, the bot runs object recognition and face detection and adds that data to its source material, expanding its conspiratorial repertoire. 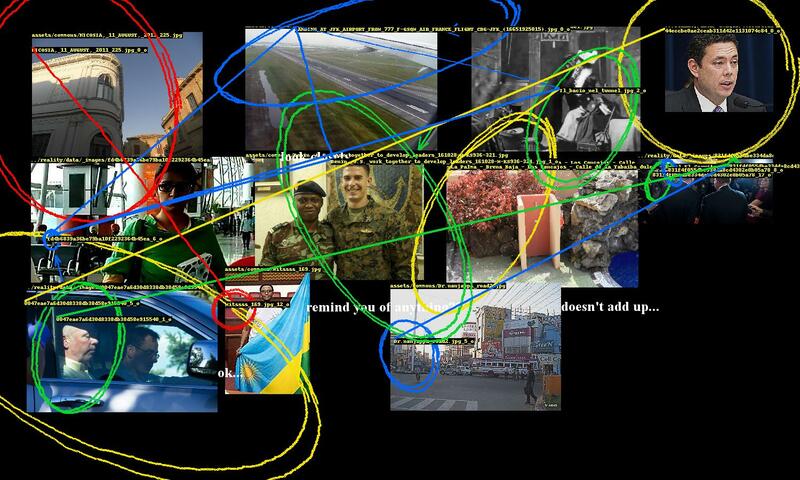 Each of these sources are sampled from separately so that every generated conspiracy includes images from both. At time of writing, the bot has about 60,000 images to choose from. To generate a conspiracy, 650 images are sampled and their entities (faces and objects) are retrieved. The program establishes links between these entities based on similarity metrics; if two entities are similar enough, they are considered related and included in the conspiracy. The FaceNet model used to compute face similarity. For objects, a very naive approach is used: the perceptual hashes of object crops are directly compared (perceptual hashes are a way of "fingerprinting" images such that images that look similar will produce similar hashes). Because reality saves a news article's text along with its image, we can also search through that text and its extract entities to pull out text-based conspiracy material. The program starts by looking for a few simple patterns in the text, e.g. ENTITY_A is ... ENTITY_B, which would match something like Trump is mad at Comey. If any matches are found, a screenshot of the article's page is generated. Then optical character recognition (OCR) is run on the screenshot to locate one of those extracted phrases. If one is found, a crop of it is saved to be included in the final output. This network of entity relationships forms the conspiracy. The rest of the program is focused on presentation. Once relationships between faces and objects are established, the next challenge is to present the implicated images in a convincingly conspiratorial way. This problem breaks down into two parts: image 1) layout and 2) annotation. Layout is tricky because it's a bin packing problem, which is NP-hard, but fortunately there exists implementations of good solutions, such as rectpack, which is used here. There is no guarantee that all of the selected images will fit, so there is some additional processing to ensure that the images that do get included have a maximal amount of connectivity between them. The generated network of entity relationships forms a graph of the selected images. Two images have an edge between them if at least one pair of their entities are linked. We start with the image that has the highest degree (i.e. the image that is connected to the most other images). We look at what images its connected to and pick the image with the highest degree out of those, and repeat. The result is a sequence of connected images, descending by degree. Here's where some style is added. Images are not placed exactly as prescribed by the bin packing algorithm; there is some "shakiness" where they are placed with some margin of error. This gives the layout a rushed, haphazard look, enhancing the conspiracy vibe. 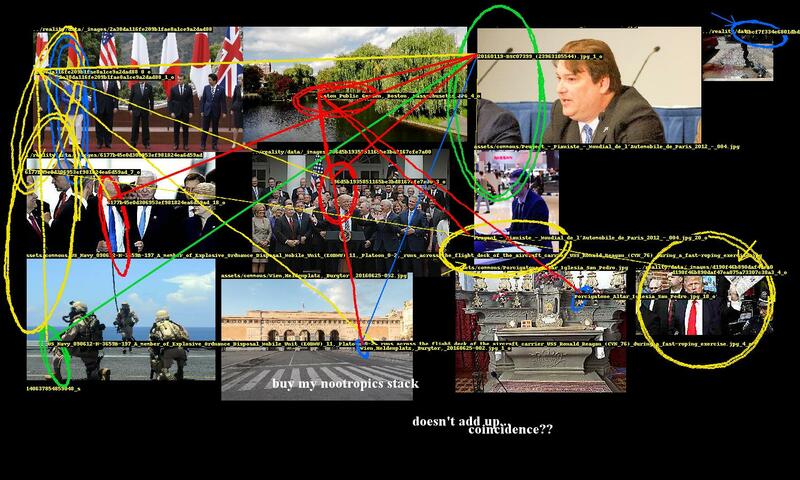 A conspiracy's entities need to be highlighted and the links between them need to be drawn. While Pillow, Python's de facto image processing library, provides ways to draw ellipses and lines, they are too neat and precise. So the program includes several annotation methods to nervously encircle these entities, occasionally scrawl arrows pointing to them, and hastily link them. These were fun to design. The ellipse drawing method uses an ellipse function where the shape parameters a, b are the width and height of the entity's bounding box. The function is rotated to a random angle (within constraints) and then the ellipse is drawn point by point, with smooth noise added to give it an organic hand-drawn appearance. There are additional parameters for thickness and how many times the ellipse should be looped. This part of the program also includes computer text, which are randomly sampled from a set of conspiracy clichés, and also writes entity ids on the images. Images are randomly "mangled", i.e. scaled down then back up, unsharpened, contrast-adjusted, then JPEG-crushed, giving them the worn look of an image that has been circulating the internet for ages, degraded by repeat encodings. Once all the images are prepared, placed, and annotated, the final image is saved and added to the webpage. There you have it - an algorithm for conspiracies.